A photo posted to the Colorado Avalanche Information Center shows the avalanche reported Sunday on Rabbit Ears Pass. STEAMBOAT SPRINGS — The recent storm that dropped more than two feet of snow at higher elevations in Northwest Colorado has increased the risk of dangerous avalanches the backcountry. A group of eight snowmobilers on Rabbit Ears Pass discovered Sunday just how high the danger was. The group reported two of their riders were temporarily buried under four feet of snow in an avalanche that one of the snowmobilers had triggered. One of the riders was pinned under his or her sled. “Probe search and extraction took 10 to 14 minutes. Both riders were OK,” the report read. The riders were wearing avalanche packs and were able to communicate with other riders via radio. The incident reportedly occurred on a steep, south-facing slope off Forest Service Road 311, which crosses Muddy Creek near Rabbit Ears Peak. Riders reported they made a “poor choice” of trails for the conditions. According to a forecast from the Colorado Avalanche Information Center, the risk of avalanches near or above treeline is now considerable in the Steamboat and Flat Tops zone. 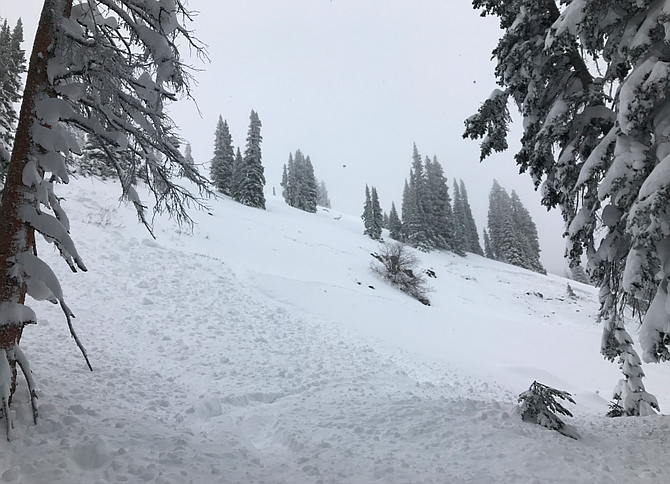 CAIC issued avalanche warnings for Summit and Eagle Counties a day after a skier-triggered slide was reported on Berthoud Pass near Winter Park.